Demon House will put you in the center of your nightmare as you walk through the stone mansion and surrounding grounds. The ominous mansion has long kept it's dark and unspeakable history a secret, allowing only those who enter to bear witness. What will you experience? With detailed sets and horrifying actors around every turn, Demon House will blur the line between reality and a hellish dream, sure to give you a chilling thrill this haunt season. You experience Demon House as soon as you step foot on the property- eerie music, camp fires, concession stand, gift shop and an outdoor movie theater are yours to enjoy before and after the attraction. Come and see for yourself why Demon House is more than just another haunted attraction! There are NO QUEUE LINES. Wander the grounds of Demon House and enjoy campfires, Outdoor Movie Theater, Concessions, Music & Apparel Shop while you wait for your journey to begin! 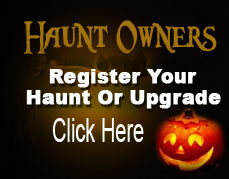 The Only REAL Haunted Attraction ! ! !